Treatment of Insulin Resistance | ECIR Group, Inc.
Now that Insulin Resistance (IR) has become the "disease du jour" the equine market has exploded with low-carb feeds and supplements to fix or cure this condition. Don't fall for it! First, understand that IR is not a disease: it is a "metabolic type". 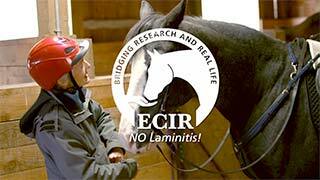 And the goal of the ECIR Group protocol is "no laminitis" ever again, with blood work as close to normal as we can possibly get — if not completely normal. The ECIR Group protocol is about a lifestyle change for your horse, i.e., a management change that owners need to be committed to. Fortunately, the horses are fine with the changes and it typically costs less than the "magic bullet" supplements on the market that don't work! It doesn't take a great leap to understand that effective weight loss comes with a controlled diet. If you have a "condition" or metabolism that does not tolerate high intakes of simple carbohydrates or fatty foods, it's not difficult to predict that the best diet will be a low-carb, low-fat diet. Humans have struggled with control of IR/weight loss far longer than equines have. A host of different medications have come and gone. Nothing works better for people than exercise and a controlled-calorie diet. The horse is no different. The learning curve for owners is to begin to understand what exactly a low-carbohydrate feed is, and how the owner can go about not only effecting weight loss but even reversing the cycle of insulin resistance. The horse is very fortunate to have a unique digestive system where fermentation of fiber in the hind gut can be either burned directly as energy sources or converted to fat or glucose once inside the body, essentially eliminating the need for high-carbohydrate and high-fat diets. The conversion of fermentation products then takes place in the horse's liver. In human IR, there is evidence of overproduction of glucose by the liver (gluconeogenesis), but this does not seem to be the case in horses — at least for the vast majority of horses. By providing calories predominately in the form of fermentable fiber, there is little to no blood glucose spike associated with eating and the liver can control blood glucose levels by releasing glucose only when and if needed to keep blood levels normal. Through trial and error over the years, the ECIR Group has found that IR horses do best on a combined Ethanol Soluble Carbohydrates (ESC) and Starch intake in the diet of no higher than 10%. The ECIR Group has also found that some chronic IR horses may require this number be even lower to keep their IR in check. Although low-simple-carb feed options are becoming increasingly available, the majority are higher than the 10% combined ESC and Starch goal. By far the safest and least expensive grain substitute is plain beet pulp, with no molasses added. It was the lowest glycemic index food in the study linked above and when owners rinse/soak/rinse beet pulp, Sugar and Starch can be as low as 5%. Horse owners have been very well conditioned by feed companies to think of our horses' nutrition in terms of what is inside a feed bag. And the missing key in horse owners' education is that hay is not just fiber: it is the single largest source of nutrients in the horse's diet. Hay is the major source of B vitamins, vitamin A, vitamin D, protein, minerals and calories, largely only deficient in Vitamin E, some trace minerals, and essential fatty acids. 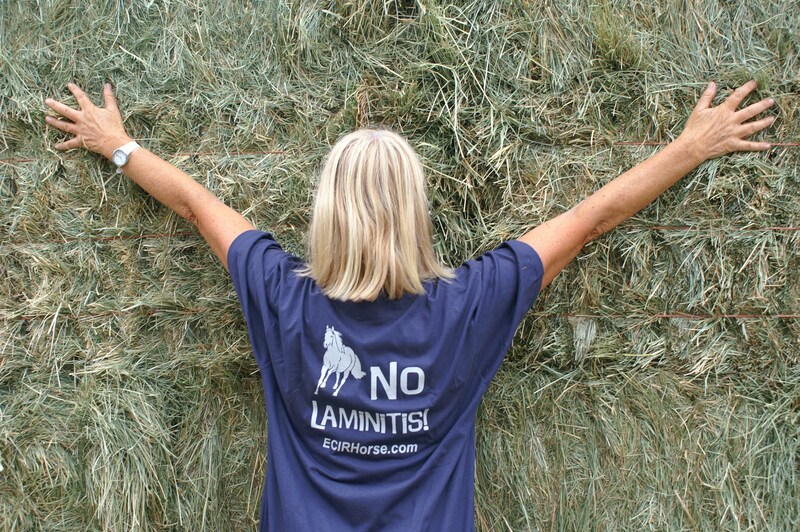 The ideal diet for an insulin-resistant horse is a low-Sugar/Starch grass hay with plain beet pulp to carry minerals, vitamin E, and essential fatty acids to complement that hay. Horses do not need a bagged feed, they do not need added fat, and they do not need protein supplementation in most cases. it is the composition of each and every individual meal. Horse owners would all benefit from learning to properly sample and interpret hay analysis. Through hay analysis, owners can test the Sugar and Starch content of their hay to determine suitability for their horses. Water Soluble Carbohydrates (WSC): Includes simple and digestible sugars (sucrose, glucose, fructose), non-digestible simple plant sugars and probably short chains of fructan (storage sugar for plants). Ethanol Soluble Carbohydrates (ESC): Simple sugars that can be extracted in a blend of ethanol and water. Please note that these labs are listed due to being the most frequently used by ECIR Group members. Other labs may be suitable but it would be wise to contact the lab in advance of submitting a sample in order to ensure that the ESC/Sugar and Starch tests are the same as the two listed. Not all labs will use the same tests for analysis of feeds. For the IR horse it is the simple Sugars (ESC extracted through feed analysis) and Starch levels that matter. These are the components that can cause a blood sugar rise. If not enough hay can be purchased at one time to justify feed analysis, the hay can be soaked in water to lower the sugar content before feeding. ESC/Sugar and Starch levels may decrease by up to 30%, based on one small study. In general, the hotter the water and the more water used, the greater the decrease of ESC/Sugar will be. As a starting point for amount of hay to feed, give the horse either 1.5% of his or her current body weight or 2% of ideal body weight, whichever is larger. This is for horses that are not being worked, and may need to be adjusted up or down for some individuals. Be aware that starvation diets DON'T WORK! Cutting calories too drastically will only worsen IR. This happens because the horse's body goes into a state of alert — a starvation warning. To conserve precious calories for key organs, IR is induced. This happens with starvation in all species, regardless of whether the individual was IR to begin with. Mineral balancing is also very important for these horses. Magnesium is a good example. Adequate magnesium is critical to both burning of fuels and storage of energy in every cell. On the trace mineral front (iron, copper, manganese, zinc, selenium, chromium), the mineral patterns very commonly found in hays are not helpful for IR control. Copper, zinc and selenium are important antioxidant minerals but are commonly deficient. With minerals, the amount you need to supplement depends on the total amount in the diet, the level of minerals that compete for absorption or worsen deficiency/toxicity, and the influence of any disease state the horse may have. The summary of recommendations below has also been published in the new textbook "Equine Podiatry" (Saunders/Elsevier) and in the February 2004 issue of the journal Compendium of Continuing Education for Practicing Veterinarians (Vol 26(2)). Feed 1.5% of current body weight or 2% of ideal body weight in low S/S hay, whichever is greater. Adjust up or down as needed to maintain body condition score of 4.5 to 5. Feed adequate but not excessive protein. Vitamin E, 2 IU/lb of bodyweight. Selenium, 1 mg/500 lbs of bodyweight unless in a high-selenium area. Iodine,1.5 mg/500 lbs of bodyweight. Plain salt, 1 oz/500 lbs of bodyweight plus free-choice plain white salt. Freshly ground or ground stabilized flax, 1.5 oz/500 lbs bodyweight.